[SINGAPORE] As slow growth and the pains of economic restructuring persist, Singapore has fallen yet another rung to place fifth on the latest global competitiveness rankings compiled by Swiss business school IMD. Singapore's third straight decline on the annual World Competitiveness Yearbook (WCY) ranking has put it behind the US, Switzerland, Hong Kong and Sweden. The US reclaimed pole position on the league table of 60 economies, thanks to the recovery of its financial sector and strong technological innovation. But last year's top-ranked Hong Kong fell to third place after being overtaken by Switzerland, while Sweden overtook Singapore to place fourth. "Singapore is the victim of the domino effect of the economic slowdown in Asia and elsewhere too," said Stephane Garelli, director of the IMD World Competitiveness Centre, which has been calculating the competitiveness of nations since 1989. Prof Garelli noted that the economy barely grew 0.2 per cent year on year in the first quarter, and for all of last year, Singapore's GDP grew an anaemic 1.3 per cent. The slowdown has been attributed to export sectors being hit badly by weak global demand, as well as domestic manpower constraints across industries. Meanwhile, inflation stayed elevated, though it fell to a three-year low of 1.5 per cent in April after policy changes wrought a plunge in car prices. This poorer performance on measures such as real GDP growth and consumer price extended Singapore's downward slide in the 2013 "economic performance" ranking from 5th in 2011 to 9th in 2012, down to 13th this year. But it was not solely the global slowdown. The impact of Singapore's ongoing push to restructure its economy towards productivity-led growth has also raised the risks of R&D facilities and production being relocated abroad too. This is based on WCY's survey of an average of 70 executives in each of the 60 economies covered. Its survey data complements hard data from international, national and regional bodies on 333 factors in four main areas, from which the economy's overall score is derived. Last year, Singapore could still lay claim to being ranked 2nd for "government efficiency" and "business efficiency", but not this year. 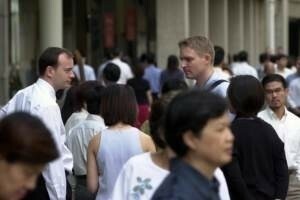 Factors such as weaker social cohesion pushed Singapore's government efficiency rank down to third, while the economy slid six rungs down the business efficiency leaderboard. This was due to sharp declines in factors such as productivity, efficiency and the labour market, as businesses adjusted to more restrictive foreign manpower policies. Barclays economist Leong Wai Ho said that the large drop in Singapore's domestic economy, labour market and price rankings does coincide with the start of Singapore's restructuring drive. As smaller companies wean themselves off a reliance on cheap, low-skilled foreign workers and adjust to the economy's higher cost structure, they will initially lose some competitiveness but should gradually regain productivity in time, he added. But Mr Leong expressed surprise that Singapore lost ground on the infrastructure rankings too, from 8th place last year to 12th this year. "This is probably also transitory, since we are spending huge amounts to refresh and extend our rail infrastructure over the next two decades," he added. The WCY said that Singapore still has a place alongside economies such as the US and Canada, ones with "very stable and enduring competitiveness models that rely on long-term advantages such as technology, education and advanced infrastructure". But Prof Garelli said that Singapore is also "moving into a new stage of competitiveness" where it will begin to face more competition from its neighbours for low-cost activities. "Singapore needs to pursue a strategy of growing niche industries, but in many different sectors to diversify the economy," he said. Mr Leong thinks that to minimise the fall in competitiveness, Singapore needs to "complete this structural quantum leap to a higher cost structure as quickly as possible". Then, the economy can begin to define its new value proposition more clearly. "Higher cost, but hopefully much higher value-added - like the Swiss and German models - centred on precision manufacturing and innovation," he said.